There have been 162 responses so far. 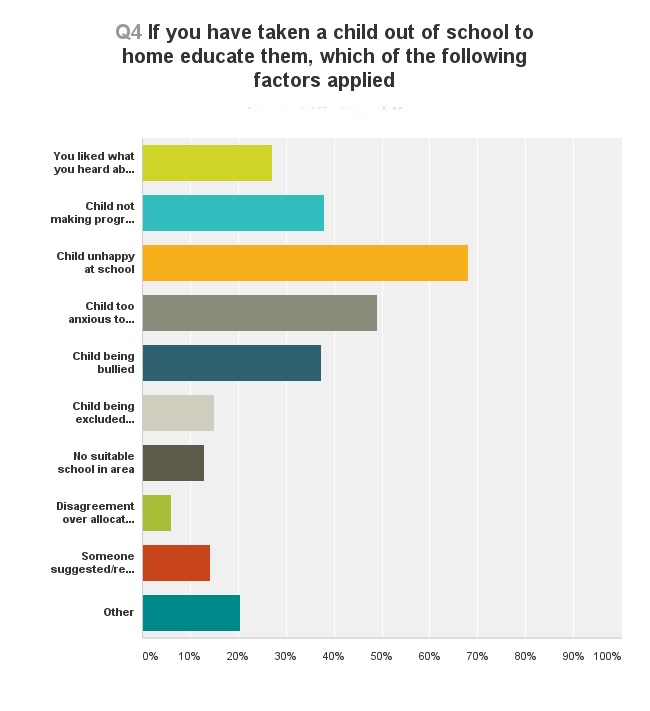 Over two thirds of parents cite the child’s unhappiness at school as a reason for home education, half say that anxiety prevented the child from attending school, and over a third said their child was not making progress at school or was being bullied. We’ve had to seek private reports to support our case even though the LA had out of date reports. They close the doors and don’t communicate in disputes. Continually breach deadlines. The school would have been dangerous for my son who is very vulnerable, I was rather pressured by LA to say we were EHE. I would love to see the plan process improved! One of the reasons for choosing home ed is that I just don’t want my child to see me fighting all the time. Ultimately I feel very let down both by central and local government. The effect that me not being able to work has on our family’s prospects is heartbreaking, and there seems to be absolutely no regard for the bigger picture. This entry was posted in Uncategorized and tagged bullying, EHCP, SEN, special needs, statement, survey on October 31, 2015 by Fiona Nicholson.